At LIBERTYAIR, we are dedicated to providing Gainesville and the greater North Central Florida region with quality light commercial heating repairs and service. Our professional heating technicians always do the job right while providing superior customer service. Contact us for all of your light commercial heating repairs and emergency service — there’s never an overtime charge with LIBERTYAIR. Call LIBERTYAIR for all of your light commercial heating repairs. The comfort level of your business and property doesn’t just affect your employees and tenants but clients and customers as well. Ensure that you aren’t losing business due to a broken heater by calling LIBERTYAIR. We offer light commercial heating service and emergency repairs so you can work in comfort. Many heating, ventilation and air conditioning (HVAC) systems in Florida are relied upon year round. The excessive use of a commercial HVAC system, which typically heats an a structure much larger than a typical home, can lead to frequent breakage and eventually require a complete replacement. Extend the life of the heating system in your office, restaurant or business with LIBERTYAIR heater maintenance, service and repairs. Call us when you first notice a problem and we can get your heater back up and running before your employees and consumers are left out in the cold. Have a heating problem? At LIBERTYAIR, we provide service and repair for any commercial business, property management companies, religious organizations, government buildings, schools and more. LIBERTYAIR ’s staff of professional technicians is licensed and certified in providing light commercial heating repairs and services. You can count on us to provide fast, reliable service to keep your business running smoothly. Have a question about your HVAC system? You can rely on LIBERTYAIR’s skilled and knowledgeable technicians to provide you with the answers you need. If you’re experiencing problems with the heater in your place of business or in a property you manage, call the professionals. Did you know that LIBERTYAIR can help you lower the monthly energy costs of your business? With a clean, properly working light commercial heating system, you can use less energy and receive a higher heat output. Our commercial HVAC technicians recommend having your heating and cooling system maintained regularly to ensure it continues to function properly throughout the year. Many property and business owners are unaware of whether the heating and cooling unit is working efficiently. At LIBERTYAIR, we can inspect your heating system to ensure it is functioning at high capacity, minimizing wasted energy and fine-tuning your system to prevent future breakdowns. Large commercial buildings and attached structures have vast interconnected systems that must work in tandem in order for heat to be distributed throughout. It’s common for air duct obstructions, dust buildup and heating system wear and tear to take a toll on a commercial appliance. 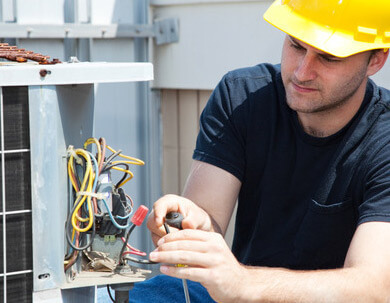 You need an experienced light commercial HVAC professional to quickly identify the issue and repair it quickly. If the heat has gone out of your business, call us right away to inspect and repair your light commercial HVAC system. You can’t go wrong with LIBERTYAIR.